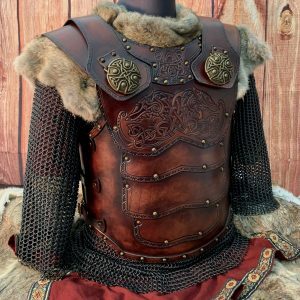 Introducing the NEW Asmund Deluxe SCA Leather Armour ,this has been professionally dyed and built by Black Raven Armoury. Created & designed by Alex Agricola, the whole set is made of premium grade top grain Veg Tanned leather? (laminated to a minimum 6mm thickness). 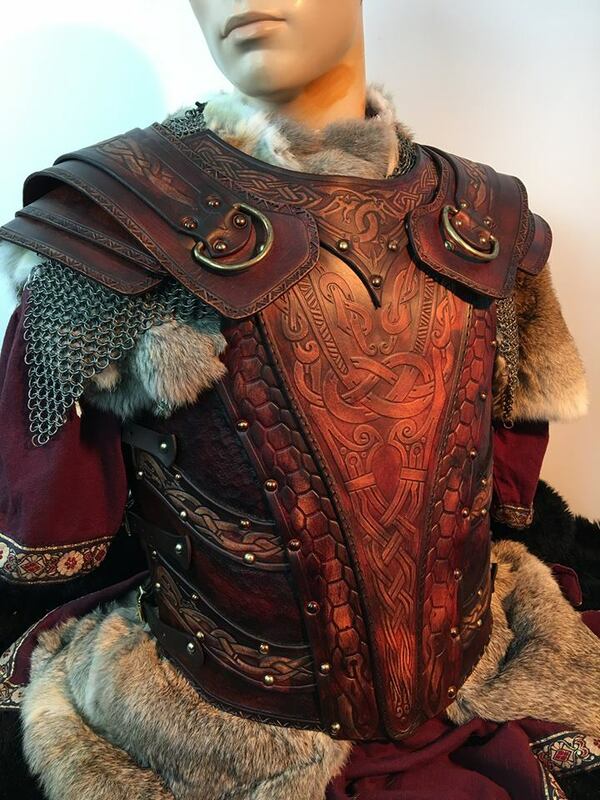 All armours come ready built and finished in the colour of your choice, apart from the undyed natural version which is left for you to stain and finish, in your own choice of colour.This Armour is available in two sizes to fit chests ranging from 40-60 inches (102 ? 152 cm?s). 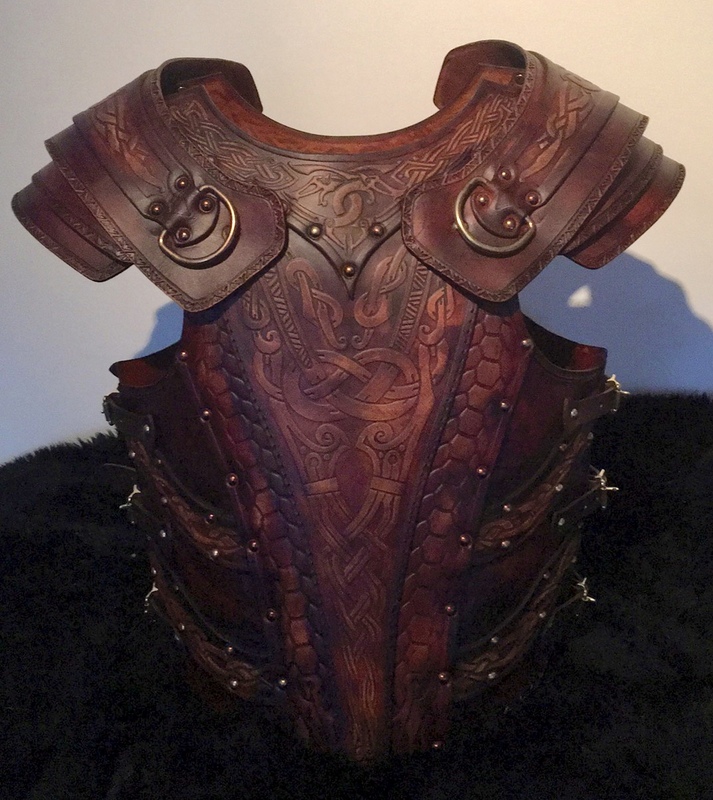 In development for 4 months, this leather armour has proved yet another worthwhile challenge, The set comprises the body, greaves and vambraces all with matching designs. 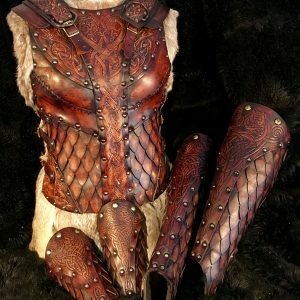 Great both as a practical leather armour, plus something that looks good as well as a design that works in true combat. 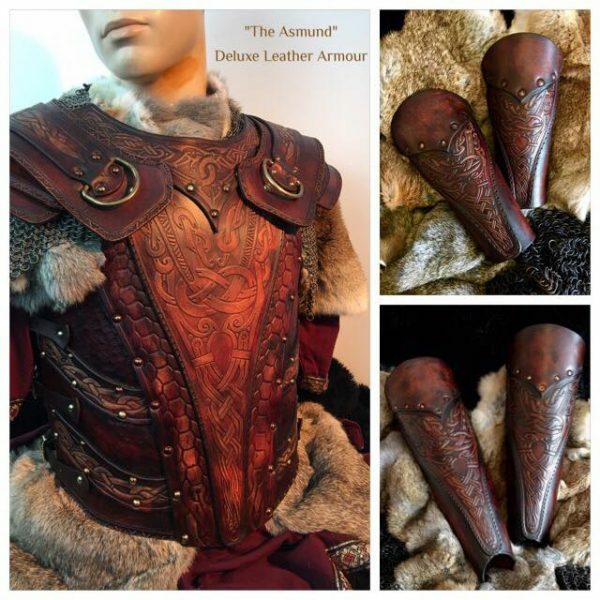 The Asmund Deluxe SCA Leather Armour has been professionally crafted and dyed by Black Raven Armoury. Conceived by Alex Agricola, the Asmund set comprises premium grade top grain Veg Tanned leather? (laminated to a minimum 6mm thickness). The Asmund is available in two sizes to fit chests ranging from 40-60 inches (102 ? 152 cm?s). 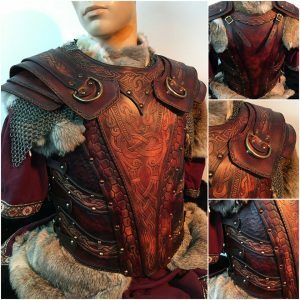 Four months in the making, we wanted to make a functional combat-ready leather armour which was stylish enough to wear to formal function. The Asmund is the end result and we’re proud of what we achieved. 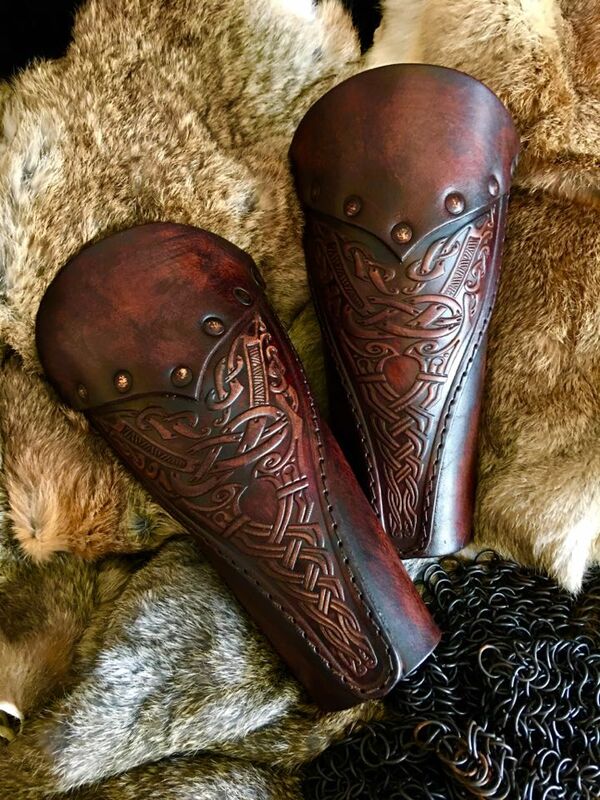 The full SCA Asmund Set comes complete with body (chest-piece, breastplate), greaves (leg guards) and vambraces (arm guards) all with matching designs. Inspiration for the Asmund comes from the Viking hero Asmund Beserks-Slayer, a character from the Icelandic saga Egils. The hand-stained and finished article is then embossed with original designs created by our own Viking hero, the artist Micke Johansson. 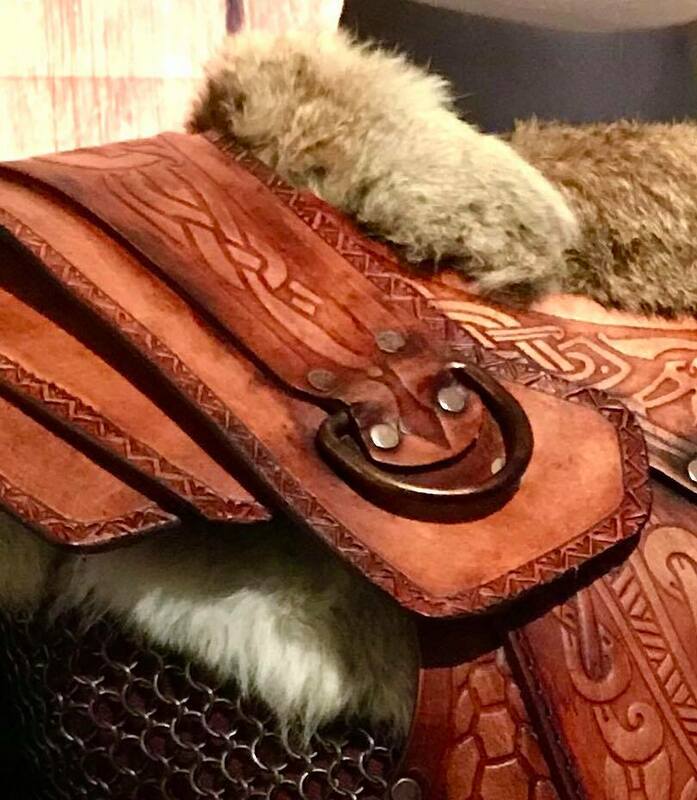 The Asmund really is a piece suitable for the field of battle and the feast to follow in the halls of Valhalla. Like all of our work the Asmund has been lovingly prepared, distressed and aged to give it that perfect antique finish. 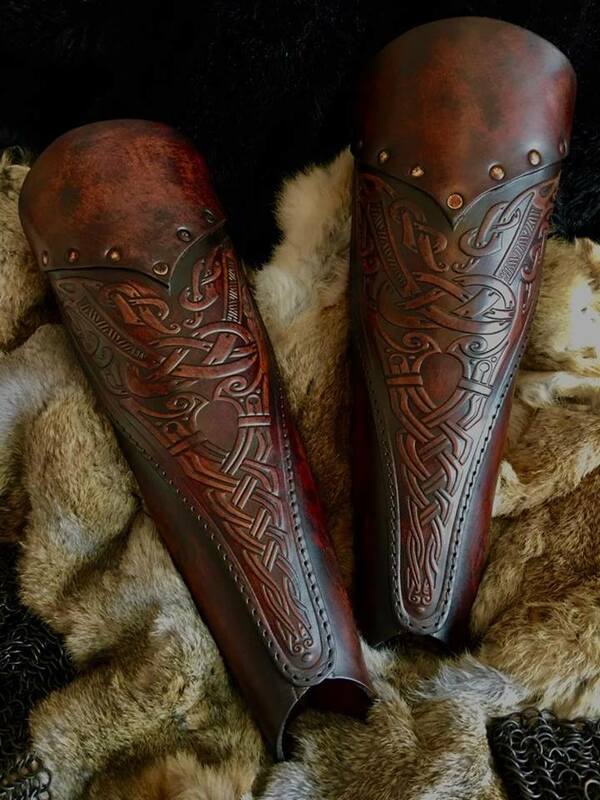 The Asmund can be further customised with additional stamp-work and is available in heavier grade leather for SCA and Heavy-weight LARP armour systems. ?Of all the Royal faires, I love Bristol the most…that’s where I saw the rider in the Norse armour… he rode a horse as black as coal and looked as if he were ready for Ragnarok. ?